One of our rules for studying voting in the House of Commons is that the government usually wins. No matter how much trouble they appear to be in, they usually get out of it. Eight years ago, when Tony Blair’s government were attempting to pass the legislation on student top up fees, the whips’ calculations on the morning of the second reading vote still put them behind by more than 20. In the end, they won by five. So it is sensible never to under-estimate the ability of any government to get its way. But still, over House of Lords reform the Coalition look to be in a whole heap of trouble. The key vote is not the Bill’s Second Reading. Given Labour support, that will pass fairly easily, no matter how large the government backbench rebellion. The key vote is the Bill’s programme motion, which sets out its timetable. Lose that – as looks likely at present, with 70 Conservative MPs calling for ‘full and unrestricted scrutiny’ of the bill – and the government is no longer in control of the timetable of the House, with the possibility of gumming up its entire legislative programme. The fact of there being two votes gives the government some room for manoeuvre – which we explain below – but it also allows for a lot of chaff to be thrown up. For example, the reported resignations from government are interesting, but unless there are some surprises coming, we suspect they will mainly be fairly junior. This will sound like the sort of thing that a whip might say: but who can remember the Labour PPSs who resigned over Iraq? Similarly, deviations within the Labour ranks – those Labour MPs who will defy their leadership’s line and vote against Second Reading – are also interesting to those who find that sort of stuff interesting (a group which includes us) but they are not that important, because they will occur on Second Reading, and – bluntly – that vote is very much second-order business this week. What matters – indeed, almost the only thing that matters – is whether the government wins on the programme motion. Anyone who doubts this should read the accounts of the attempted passage of the Parliament (No 2) Bill from its Second Reading in November 1968 until the government, exhausted, withdrew it having failed to achieve closure on April Fool’s Day, 1969. We set out below some benchmarks for understanding the scale of any rebellions. One problem we have is that there have not been many recent whipped votes on Lords reform against which we can (sensibly) compare, and so most of the more useful comparisons are with rebellions on other issues. Anyway, these may be votes about Lords reform, but no one is so stupid as to think they are only votes about Lords reform. This is also as much (more?) about kicking – Conservatives kicking their leadership and the Lib Dems, Labour kicking the government, and especially the Lib Dems, whilst many Lib Dems just kick themselves. The Blair and Brown governments both attempted to address Lords reform, but the majority of the action either took place on free votes or never even made it into the Commons voting lobbies. The extent of party divisions were clear in a series of free votes in 2003, when the Commons failed even to take a position on the issue. Four years later the Commons voted in favour of a Lords that was 80% or 100% elected, but the Labour and Conservative party splits on both votes were massive. In 2007, on 80% election, Labour split almost down the middle (159 in one lobby, 164 in the other); the Conservatives were only marginally more united (80 in one lobby, 98 in the other). The vote on 100% elected saw a majority of Labour MPs vote in favour (but with almost 100 voting against); the Conservatives were similarly divided (57 in one lobby, 126 against). This is, and has long been, an issue where the frontbenches try to lead, and the backbenchers often refuse to follow. (The Lib Dems have been much more solid on this in recent years, at least in the Commons, but we know their peers take a somewhat different view). We are, in general, sceptical about the benefits of comparing free votes like this with whipped votes, where the pressure can be very different, and in addition there has since been a huge change in personnel in the Commons, especially on the Conservative side. Prior to that, Lord Irvine’s 2001 White Paper on Lords Reform (proposing a mere 20% election) was withdrawn before it even got to the stage of legislation in the face of backbench Labour opposition. The Brown government included aspects of Lords reform in its Constitutional Reform and Governance Bill, but most of this never got voted on, and was dropped when the 2010 election intervened. This gives us relatively few whipped votes in the last decade or so explicitly on this subject, with which we can compare. But as a result, it will be relatively easy for this week’s rebellions to set some records. We set our below five ways to measure this week’s votes. The largest government rebellion on Lords reform since 1997 came over the House of Lords Bill in 1999 which removed (most of) the hereditary peers. 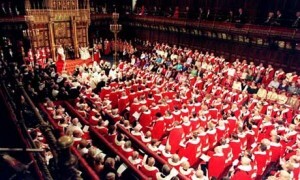 On 16 February 1999, 35 Labour MPs backed Bob Marshall-Andrews’ amendment to limit patronage in the reformed Lords. We expect that figure to be comfortably broken this week. Going back further, the largest rebellion against the whip by government MPs over Lords reform in the post-war era came in November 1968, when 47 Labour MPs voted against Richard Crossman’s white paper on the subject. Anything larger than that therefore will constitute the largest rebellion in the post-war era on the subject. The largest programme motion rebellion by government MPs this Parliament has comprised 43 MPs (41 Conservative, 2 Lib Dems), who rebelled over the programme motion for the Protection of Freedoms Bill. That is larger than any programme motion rebellion during the Blair and Brown years. In other words, a rebellion of 43 MPs or more will match or better the largest programme motion revolt since the current procedure was introduced. The largest second reading rebellion so far this Parliament comprised just 11 MPs –over the Fixed Term Parliaments Bill – so we expect that record to be easily broken. The largest second reading rebellion by government MPs in the post-war era stands at 72 – a record shared by both the Shops Bill (1986) and the Higher Education Bill (2004). That is a tougher hurdle, but given some of the predictions being made, one that is entirely possible. The largest Coalition rebellion so far this Parliament numbered 82 MPs voting against the whip (81 Conservatives, one Lib Dem) and came over the issue of a European referendum in October 2011. More than 81 will therefore be the largest Conservative rebellion of this Parliament. More than 82 will therefore be the largest Coalition rebellion of this Parliament. To be the largest Conservative rebellion in the post-war era would require beating the 95 Conservative MPs who rebelled in the dog-days of the Major administration against its post-Dunblane reforms to the gun laws. (A figure of 95 would also match the number of Labour MPs who defied the whip over the renewal of Trident in March 2007). If any rebellion numbers more than 139, then it also tops Labour’s Iraq rebellion in March 2003 – and is the largest since the birth of modern party politics. If the government go down to defeat, it will not be their first Commons defeat. That came in December 2011, on the motion that the House had considered the economy. It was an old-fashioned parliamentary ambush – Labour MPs hiding, until enough Conservative MPs had gone home. Should the Government go down to defeat on Lords Reform, however, it will be the Coalition’s first Commons defeat caused by its own MPs defying it. It is worth noting that this has happened to every Prime Minister since Edward Heath – even Mrs Thatcher, when she had far larger majorities – so a defeat is not in itself an extraordinary occurrence. Aside from the Opposition ambush of December 2011, the lowest Government majority thus far (on a whipped vote) has been 21 (on the votes on student fees in December 2010). There is, in the run up to all key votes like this, frequent talk of ‘100 rebels’ or ‘150 prepared to defy the government’. What such reports fail to say is how these people will defy the government. Each rebel that can be persuaded to abstain deducts only one from the government’s majority; each MPs who cross votes deducts two. The total number of MPs who actually vote with the opposition is almost always less than the numbers discussed in the media because of this. That there will be (at least) two votes –one on second reading, one on the programme motion – may sound like bad news for the government. But it will also allow the whips to practice the age old tactic of divide and rule. Imagine you have two MPs – let’s call them Peter and Philip, just for the sake of argument. Both dislike a policy and/or feel they need to vote against it to save face. If both vote against, you lose. But with two different votes coming up, then you say to Philip: ‘Listen, we understand your position. Sure, vote for the amendment, but if the amendment falls, then we’ll need your support on the main motion’. To Peter you say the opposite: ‘Listen, we understand your position. As long as you back us on the amendment, we will understand entirely if you vote against over the main motion’. Both vote against. Both save face. Both can tell their constituents and/or local party they defied the whips, and voted against the measure. But because both did so at different times, the government still gets its policy through. We first drew attention to this over foundation hospitals back in 2004, when enough MPs rebelled to defeat the measure, but they rebelled at different times, on different measures. It has happened frequently since. On this occasion we assume the whips will be saying to all potential rebels something like: ‘We of course understand your principled position on this difficult issue, so by all means vote against the Bill at Second Reading if you feel you need to. But not the programme motion’. That tactic won’t work with all MPs (and maybe not all that many) but by allowing a pain-free rebellion on one vote, the whips will hope to chip away at those on the margins of the rebellion. As a result, the total rebellion over Lords reform will almost certainly be larger than any rebellion on individual votes. MPs of all parties have become especially keen on the practice of voting twice in divisions in order to register an abstention. Apart from anything else, it gets their voting record up. Checking the size of the no lobby alone therefore will not be sufficient, and could (slightly) over-estimate the size of any rebellion.